The iconic black cab is changing - and this is what it's going to look like. After years of delays we will finally see new black cabs hitting the streets of the capital by the end of 2017. And the big news is that it's going to be electric - well almost. Named the TX, it has a range of over 400 miles, although only 70 miles is by electric power. After that it needs a range extender - a small petrol engine that generates electricity to take it further. The switch from diesel to electric aims to combat the growing issue of air pollution in London, as well as saving drivers an average of £100 per week in fuel - according to its manufacturer. Black cab drivers cover 120 miles per day on average, so the new black cabs should run off battery power, without emissions, most of the time. The change is also down to Transport of London (Tfl) rules, dictating that all new black cabs from 1 January 2018 will need to be capable of producing zero emissions. The rectangular grille and circular headlights are remincsent of the classic London black cab. However, the design has incorporated modern features like daytime running lights. 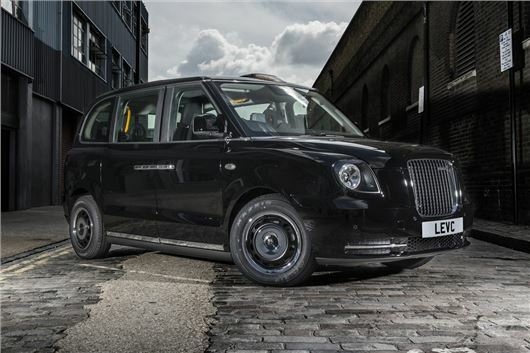 Built by LEVC - formerly called the London Taxi Company - the new cabs are also said to have a more 'premium feel' inside. It helps that LEVC is part of Chinese firm Geely, which owns Volvo. So it's no surprise to see lots of Volvo parts inside, as you can see from the picture above. LEVC is promising less vibration and noise in the passenger cabin, which you'd hope given the change from ancient diesel engines to modern electric power. As well as a far nicer cabin for the driver, there's also plenty of modern touches for the six passengers it can carry including charging points for mobile phones and wi-fi. The black cab will also retain its easy access for disabled passengers with a new retractable integrated ramp making it quicker and easier for drivers to load passengers in wheelchairs in a new forward facing position. LEVC hopes to have around 150 of the new black cabs on the on the streets of London by the end of 2017. TfL currently anticipates that, by the end of 2020, 9000 London taxis will be zero emissions vehicles. This will be a real test for the electric motors. Melbourne has hybrid taxis (Toyota Camry) which are very quiet and pretty quick. Ha this should be interesting as wont be that many black cabs on the road by then as they have killed the trade off. 120 miles! well many live outside london now my friends is a 40 mile trudge into town each day then cover quite a bit each day while working. But how about all these gizzmo's there putting in them then add wipers on in a wet london, heater,heated rear window plus mirrors,power steering motor(if that lasts long enough without breaking! )lights and other battery drainers! think there range will be pretty short! so running on petrol engine a lot. TFL to the rescue yet again size 20 clogs stamping on everything. The newer diesels are far cleaner than any petrol engine now. These and buses would be far better running a small efficient turbo diesel set to run at optimum speed powering a generator with the engine not connected to driver just a load sensor on generator there by no sudden increases/decreases in revs so no unburnt fuel being emitted and far more fuel efficient and has full control over revs of engine can use set filter so no harmful emissions. Still just as difficult to get into / out of - why the doors can't be extended to be level with the rear seats (like a normal car) I can't imagine. I suffer with a bad back (and I'm 6'2 tall) and getting into/out of existing cabs can be a real pain.